WHAT IS THE OLSSON RUBY? 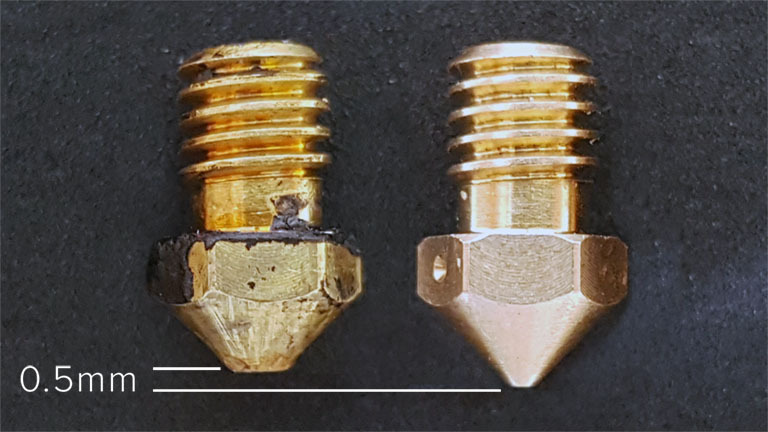 It’s a unique nozzle for 3D Printers, designed to print highly abrasive materials while retaining the excellent heat conductivity of brass. It works equally well for printing common FDM / FFF 3D printing materials up to 300C. There is also a high temp version of the Olsson Ruby, enabling the use of high temp materials up to 500C. WHAT IS THE BENEFIT COMPARED TO STANDARD BRASS NOZZLES? 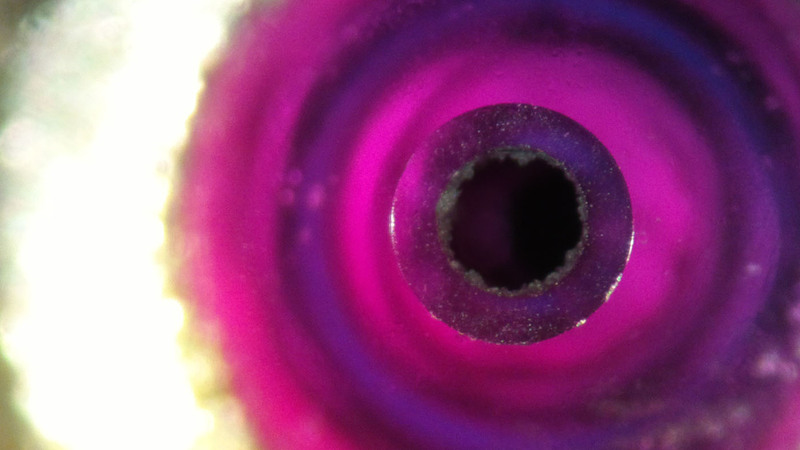 The tip of the nozzle consists of a ruby gemstone – technically Aluminum Oxide – which is a very hard material. This means that it is very durable even when printing exotic materials containing abrasive materials. See list of tested materials. 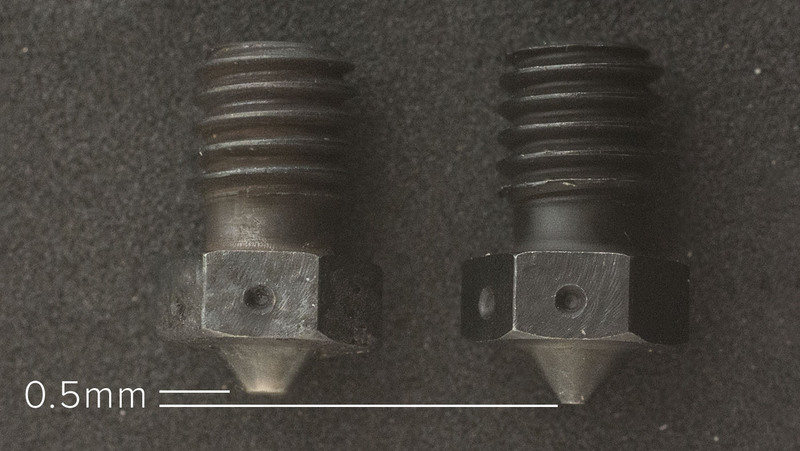 Some people have also seen a improved surface finish with the ruby tip (compared to brass nozzles). ARE THERE ANY DOWNSIDES COMPARED TO A STANDARD BRASS NOZZLE? So far, we have only seen benefits. Join the discussion on the Internet forums. WHAT IS THE BENEFIT COMPARED TO STAINLESS STEEL OR OTHER, COATED, NOZZLES? Since the base material is brass – which has an outstanding heat conductivity – the Olsson Ruby has a big advantage to most other materials (for example stainless steel). Also, the tip is made out of ruby which is very hard and durable. Our experience is that nozzles with different coatings will wear off quite quickly when continuously printing/grinding towards an abrasive material (the model being printed). 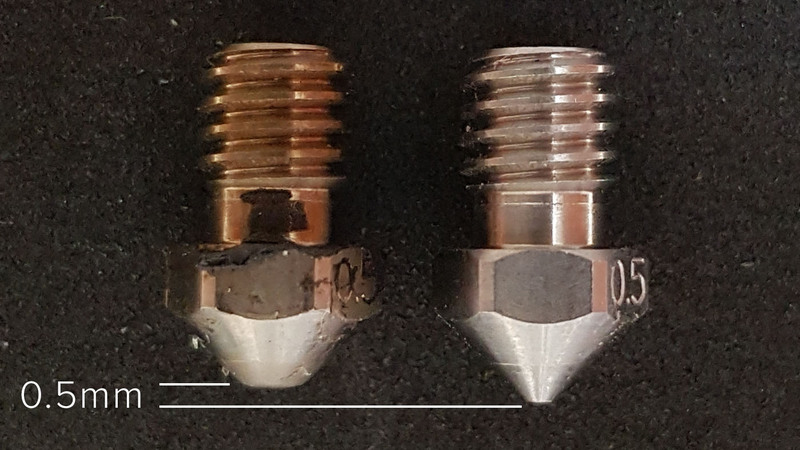 See our test results with different nozzle materials below. The High Temp version is made of a special high conductivity copper alloy, and uses the same ruby tip as the standard version, sharing the same benefits as described above. In addition to this, it supports printing temperatures up to 500C and the body is coated with a high performance non-stick chromium nitride surface, resulting in smoother and cleaner prints. This surface can withstand these high temperatures and does not wear off since it is never in contact with the print surface. WHAT IS THE OLSSON RUBY HIGH TEMP? Just like the standard Olsson Ruby nozzle, it is a unique nozzle for 3D Printers, designed to print highly abrasive materials. As the name suggests, the high temp version is designed to print high temperature materials. It supports printing temperatures for up to 500C, making materials such as Carbon-filled PEEK or Ultem possible to print. In addition to this, the high temp version is made from high conductivity copper and is coated with a high performance non-stick chromium nitride surface. This results in smoother and cleaner prints. Which 3d printers is the Olsson Ruby compatible with? WHAT MATERIALS CAN I PRINT WITH THE OLSSON RUBY? In some cases it’s advisable to increase printing temperature 5-10C depending on material and type. WHAT IS THE MAXIMUM TEMPERATURE FOR THE OLSSON RUBY? We do not recommend using The Olsson Ruby nozzles at temperatures above 300C. If you have the need for higher temperatures, The Olsson Ruby High Temp is designed for use up to 500C. WHO INVENTED THE OLSSON RUBY NOZZLE? The Swedish research engineer Anders Olsson from Uppsala University. Full story. WHO MANUFACTURES THE OLSSON RUBY NOZZLE? 3DVerkstan from Sweden. Read more. How does the wear resistance compare to other nozzles?